PDO threads is a strong synthetic bio-resorbable filament used in the medical field for more than 40 years. They are a suture of choice in cardiology, plastic surgery and gynaecology mainly because of its unparalleled safety record with its ability to dissolve, completely after 7 to 8 months leaving no residue. It is precisely this increased safety that is at the core of the appeal of PDO threads in the aesthetic industry. PDO thread lifts offer long lasting results that can last between 12 to 18 months. While the introduction of PDO threads in the aesthetic industry is fairly recent, its rising popularity has made it something of a staple with the cosmetic doctors. PDO threads is a revolutionary non-surgical face lift, otherwise known as a threadlift, that can restore the contours of the youthful face without the risk and complication of traditional surgery. PDO cog threads which have soft barbs are inserted deep below the skin via a thin cannula reducing the risk of trauma and injury, to lift sagging tissue to a more youthful and desired position. 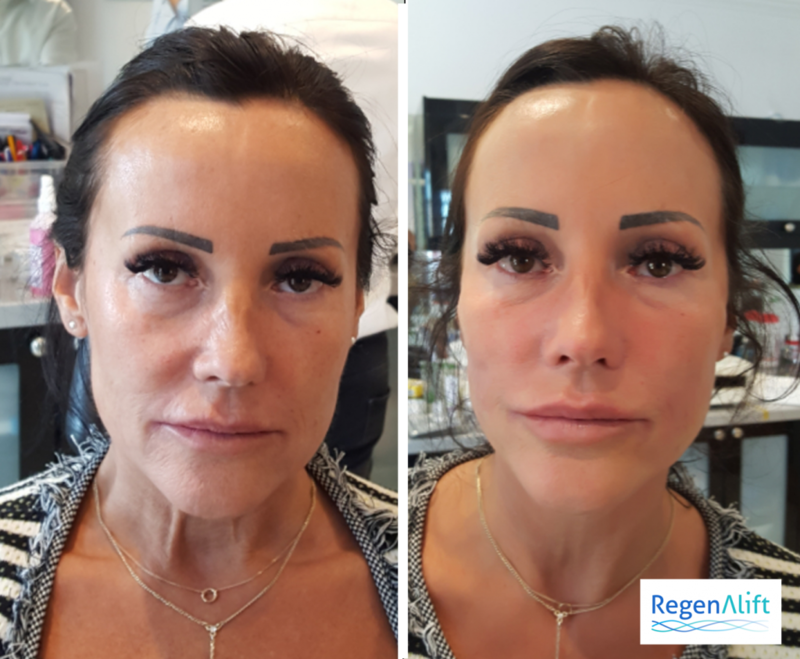 Using the latest technology, RegenAlift PDO threads are designed to make insertion easier as well as painless and with the various designs and sizes, medical practitioners can now non surgically perform a full facelift or treat individual parts of the face such as a cheek lift, brow lift or even a neck lift. All this, without a scalpel in sight. Safe, painless and no downtime. 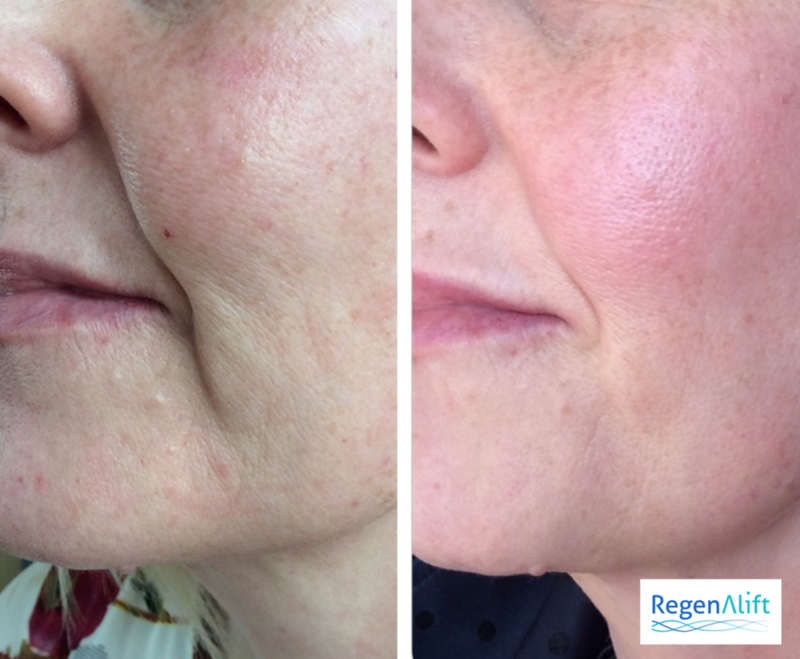 RegenAlift PDO threads fall in two basic categories skin regeneration and face lifting. They can be used on their own or to complement each other to work in synergy. Skin regeneration threads are very fine, are inserted superficially, they are used to create elasticity, tighten and even out wrinkles. 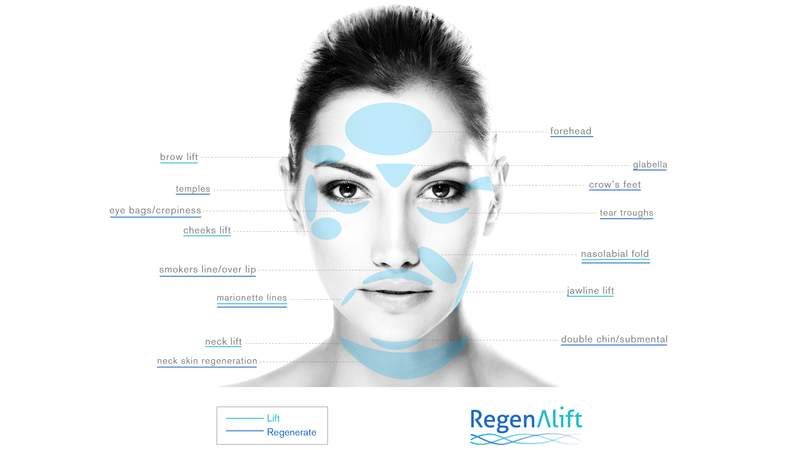 Face lifting threads have soft barbs or cogs that mechanically lift sagging skin. When both skin regeneration and face lifting PDO threads are used together, practitioners can achieve spectacular results. 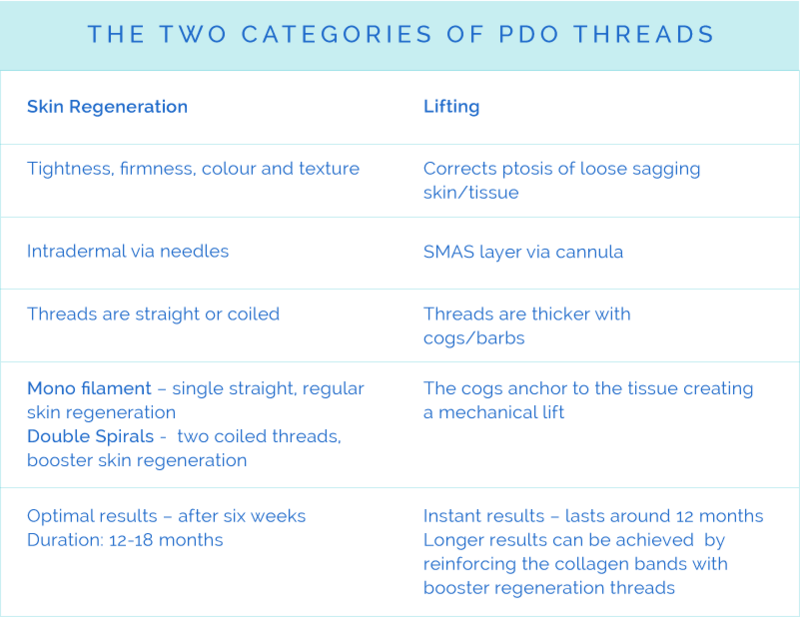 When used together PDO threads can give a very “finished” look because it addresses the sagging tissue as well as the general texture and appearance of the skin. PDO threads have become a staple treatment in most clinics sitting side by side with botox and fillers. They can create impressive results on their own as well as enhance and complement other treatments. It is important to note that botox paralyses the muscles and does not treat the texture and condition of the skin, whereas, the skin regeneration PDO threads do exactly that, they even out the lines and wrinkles, thicken the skin and improve the texture, elasticity and firmness of the skin. The threads are a longer lasting treatment, producing collagenesis at 8 weeks, the process of creating 100% new mature collagen. These results can last between 12 to 18 months. Due to the Collagenesis process, they are the perfect complimenting treatment to botox, gradually kicking in as the botox wear off. Similarly, fillers are great for restoring lost volume but have a little physiological impact on the skin. PDO threads create 100% new mature collagen which improves the texture and appearance of the skin, so it is excellent to treat the areas that need regenerating to restore the elasticity and firmness but do not need a huge volumising effect. They are perfect to treat lines, wrinkles and folds such as the crows feet, eyes bags, forehead, nasolabial and marionette over lip lines and of course the neck. 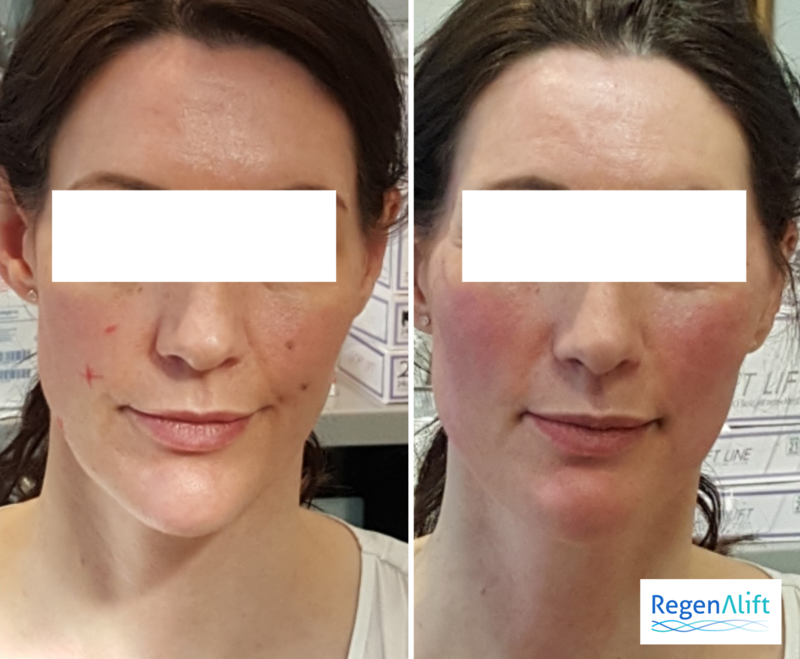 However, what sets it apart from other products and has revolutionised the aesthetic industry is that PDO threads give you a lifting solution, a safe and simple option over the conventional, more invasive facelift. What areas can be treated with the PDO Threads? Thread lift is suitable for anyone who is experiencing skin laxity. Skin regenerating threads are for those. Who would want to tighten their skin and have a general improvement of skin quality. Safe, simple and effective procedure with no downtime. PDO are inserted to act as a foreign body in the skin. It is the impetus needed for the body to create the collagen. And elastins needed to heal itself. This is created using regenerative PDO threads, which are planted at a superficial level. Lifting PDO threads have small hooks and barbs that are used to create a mechanical lift. There are far fewer risks involved in using PDO threads for a face lifting. Although, some patients have observed some bruising and swelling. The two treatments can be used on their own or in combination for even better results. Thread lifts can take between 40 mins to 1 hour. After the procedure, you can resume your daily life straight away with the skin regeneration therapy and generally within 24 hours with the thread lift. Although, some may experience mild bruising that could last a few days. The procedure generally last for 12 to 18 months.